The scholarship is named in honor of the late Robert G. Bone, former president of Illinois State University. Bone Scholars are selected through a rigorous campus-wide competition on the basis of their scholarly achievements and their engagement and leadership in activities in the university community and beyond. During the Spring 2016 semester, 54 invited finalists each submitted a comprehensive portfolio, featuring several essays and statements, a project, and five letters of recommendation. 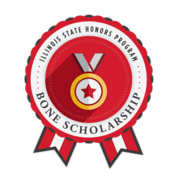 Selected Bone Scholars were encouraged to select a portion of their submitted portfolios to feature as exemplary evidence in conjunction with the digital badge issued by the Illinois State University Honors Program. Congratulations! This badge commemorates your selection as a Robert G. Bone Scholar, the most prestigious university-wide honor annually bestowed to 14 undergraduate students at Illinois State University.